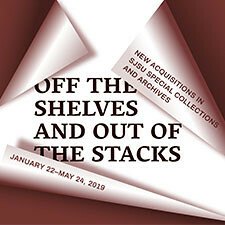 SJSU Special Collections & Archives exist to acquire, preserve, arrange, describe, and make accessible its rich holdings of secondary and primary materials to support the diverse teaching and research needs of undergraduates, graduates, faculty, staff, and the larger community. These collections document local, regional, and California history, with a specific focus on history, politics, literature, and art. In addition, the Department is responsible for documenting the history of the university, and has a large collection of university and faculty publications, administrative records, photographs, and ephemera.